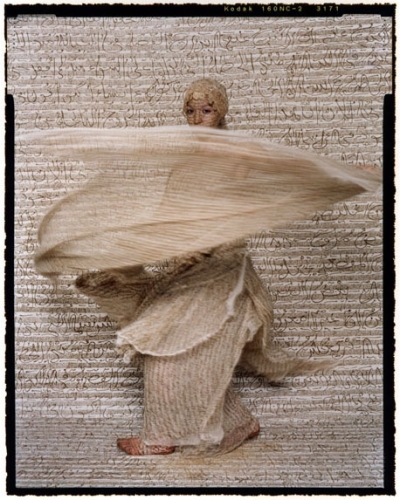 Grazia Middle East names Lalla Essaydi as one of 5 MENA artists you need to be following. The Middle Eastern and North African art scene has a long history of producing empowering works that celebrate our heritage as a form of educating others, as well as spreading a positive message. Here are five artists who remind us of the importance of peace, and celebrate the vibrant culture of the Middle Eastern people. This Moroccan-born photographer invites viewers to resist stereotypes set upon Muslim women. Combining Islamic calligraphy with representations of the female body and identity, Essaydi attempts to destroy these labels by shedding light on such issues and educating the public. As a result of the uprisings in his native land, Syrian artist Tammam Azzam has used his platform as a way of protesting. One of his most popular works, Freedom Graffiti, went viral due to his rendition of Gustav Klimt’s iconic piece The Kiss which was placed over a war-torn building. A powerful juxtaposition of beauty and devastation. Growing up in the emirate of Umm Al Quwain, this Omani national is the first sand artist in the Arab world. Using this medium as a way to spread awareness on certain issues through storytelling, the self-proclaimed “Queen of Sand” creates drawings to music in a performance that is projected onto large screens. Catching our eye at Art Dubai, this Syrian artist poetically captures the spirit of displacement and disorientation through his abstract works. Seeking refuge in Jordan back in 2012, Koshaji uses his art to create references to people he has left behind. By breaking down figures to their most basic elements through lines and sections, he creates a distortion of his original subject as a subtle way of representing loss. This Saudi artist transforms consumer goods that are part of her country’s popular culture into ultra-contemporary works of art. She takes everyday items such as cassette tapes and bowls and turns them into symbols of love and friendship to represent the good in the world. Her installation entitled Food for Thought 'Amma Baad' which literally translates to “Whatever Comes After” is an arrangement of 2,400 colourful audio tapes placed together. The tapes mold together a series of words hinting at the struggles set forth by women.